Goa’s cheerful coasts are now spotted with sweet memories. Welcomed with the warmest hugs, Iceberg Ice Creams have launched six new stores in Goa. The all-natural ice creams make for the perfect end to your day, or the little treat for your loved ones. Starting with the launch of the store in Porvorim in December 24, 2016, the brand has grown to be a favourite Ice Cream in Goa. The expanding franchisees live upto the blissful dream. The end of 2017 witnessed bliss in Baga and serenity at Siolim. Others stores have successfully been opened at Panaji, Margao and Mandrem during the course of 2017. Iceberg Ice Creams was started with a dream to touch the common man’s heart with a rainbow of flavours. Iceberg, with the richness of milk-cream and natural flavours, is a daily treat for the persevering ones. 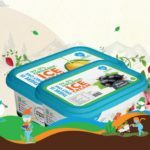 The brand, which was started in 2012 by the BMK Group, intends to bring a range of pan and mist recipes for the customers to indulge in, and is the first to introduce Dragon’s Breath desserts in India. The brand represents the taste and feel of today’s world. It is tasty, healthy, nutritious keeping in mind the vision of a healthy lifestyle.